ISA10 is a new intuitive Epinephrine auto-injector for patients with severe allergy that guides users with sound and light, ensuring correct usage of the device. In comparison to today’s injectors, ISA10 will help you to a higher degree. After the injection is completed a mobile application accompanying ISA10 will contact the nearest hospital so you can get emergency medical care at once, this is crucial but many patients don’t know or forget about it. The application will also help you locate the auto-injector in an emergency situation, remind you of medicine expiration dates and help you with prescription renewals. Unlike other devices of this type ISA10 consist of disposable capsules and reusable core element that helps to minimize medical waste. It can also potentially lower the cost of a single injection. 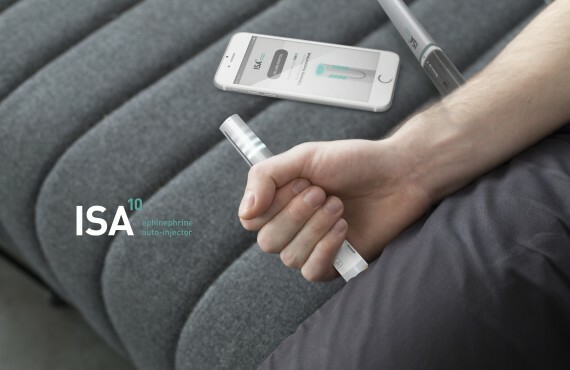 ISA10 creates a new way of interacting with auto-injectors. A safer, more environmentally friendly and a supportive way by ensuring you that every step of the situation is covered. This is why ISA10 deserves to win the “Disrupting category” of the IxDA Awards 2017. ISA10 – Empowering patients, not stigmatizing them. ISA10 is a new intuitive Epinephrine auto-injector designed to be a helpful companion and support you in the stressful and unknown situation of an Anaphylaxis attack. ISA10 is giving confidence to its users by keeping them in control of their own emergency situation something that will help save your life. According to research 84% of patients misuse auto-injectors during an Anaphylaxis attack due to stress and lack of important information, something that can have fatal consequences. By using sound and light as a support to guide the user through the process the patient will now feel in control and be reassured they completed the treatment correctly. It’s form language is not intimidating and is designed to help the user handle it correctly. The subtle look allows you to handle it in a discreet manner even in public spaces. Today’s auto-injectors are very scary and complex looking to users. ISA10 will change the way way the patient feel about their own self-efficacy and their life saving auto-injector. This is a product that enables users with no medical training to be in control of their own health and emergency situations, and that is why ISA10 deserves to win the “Empowering category” of this year’s IxDA Awards.